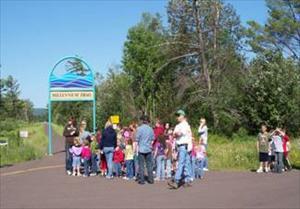 In June 2009, the City of Superior dedicated the new Interpretive Trail and Outdoor Classroom at the head of the Millennium Trail in Billings Park at Wyoming and 28th Street. Below left: With the weather cooperating and the sun shining, over 100 children from Cooper Elementary and Four Corners Elementary Schools were the first to enjoy this new outdoor opportunity in Superior's Municipal Forest. 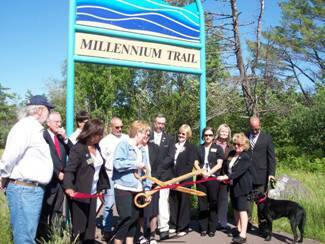 Above right: Jane Edwards, Project Coordinator from ESDPW cut the ribbon that officially opened the trail. From left to right is Larry MacDonald, Mayor of Bayfield and the President of the Wisconsin Coastal Management Council, Superior Mayor Dave Ross, Rani Gill, City of Superior Mayor's Office, Todd Brieby, WI Coastal Management Program, members of the Superior/Douglas County Chamber of Commerce Ambassadors with Chamber of Commerce President Dave Minor at the far right. Judy Hack, teacher from Cooper Elementary School explains the first interpretive sign to some of her students. City of Superior Mayor Dave Ross shares a moment with the students in the outdoor classroom. The classroom is available to classes, outdoor groups, environmental groups and outdoor enthusiasts. Six interpretive signs highlight the forest history, ecology, flora and fauna. We have a TEACHER'S TRAIL TOOL-KIT available for checkout! Click for more information. Funded by the City of Superior, WI DNR, WI Coastal Management Program, National Oceanic and Atmospheric Administration, Office of Ocean and Coastal Resource Management under the Coastal Zone Management Act, Grant #NA07NOS4190064.